PZ Cussons, the owner of brands including Carex and Imperial Leather, has defended its efforts to improve achieve sustainable palm oil production, after a spoof ad by Greenpeace slammed the company's track record. The ad, created by Greenpeace with OBR Studios, parodies ads for household and personal care products, featuring various idyllic scenes with a focus on people’s hands, with a soothing a capella song over the top. But the song’s lyrics accuse the company of selling consumers "an utterly false belief" and being "dirtier than you think". 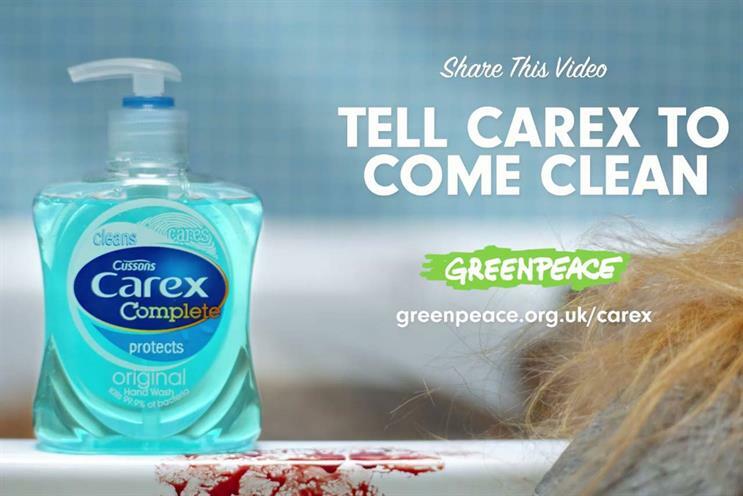 It finishes with the line: "Carex: come clean about palm oil". The film was directed by Murat Gökmen and Steve Bliss from OBR Studios. Greenpeace accuses PZ Cussons of being one of eight major FMCG companies that have refused to take action to eliminate palm oil from their supply chains that is causing forest destruction in Indonesia. According to the charity, 100,000 orangutans have been lost in Indonesia in the last 16 years as a result of deforestation. The other seven companies named by Greenpeace are Ferrero, Hershey, Kellogg’s, Kraft Heinz, Johnson & Johnson, PepsiCo and Smucker’s. In contrast, it said that another eight companies it had challenged had made progress towards improving sustainability: General Mills, Mars, Mondelez, Nestlé, Procter & Gamble, RB, Unilever and ColgatePalmolive. Daniela Montalto, Greenpeace UK forests campaigner, said: "Carex’s slogan, ‘cleans, cares, protects’ means nothing when the brand is carelessly buying dirty palm oil from companies that destroy rainforests in Indonesia and refusing to do anything about it. "Carex’s parent company PZ Cussons promised that by 2020 forests and orangutans wouldn't be sacrificed for the palm oil that’s used to make their hand wash. But they're way off course and unless they start taking action now it will be too late." A spokesman for PZ Cussons said that securing a long-term sustainable supply of palm oil was a "priority" for the business. He said PZ Cussons had held a meeting with Greenpeace yesterday morning (19 March), at which it had provided a list of its key direct palm oil suppliers, and the mills from which they source. He added: "All our key direct suppliers have made ‘No Deforestation/No Peat/No Exploitation’ commitments and are members of The Forest Trust , supporting transparency of mills through their public dashboards. "Working with our NGO partner TFT, we have had full traceability back to the refinery since 2016 and can currently trace 86% of our palm oil back to the mill. Longer-term, we seek to achieve full transparency including ingredients derived from palm oil." Could cats on the Tube offer a glimpse of better advertising?